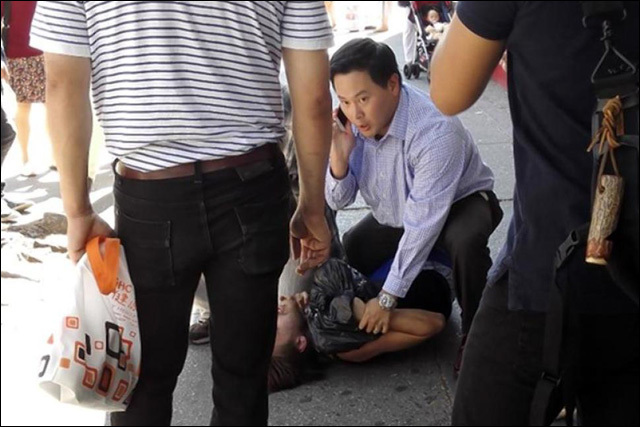 Queens assemblyman Ron Kim chased down and tackled a street robber in Flushing. People, what has your local elected official done for you today? This one catches street robbers! In Flushing, a would-be purse-snatcher was thwarted and caught -- tackled, no less -- by a New York state assemblyman. Ron Kim, a two-term State Assemblyman from Queens, was walking on the sidewalk in Flushing on Thursday when he saw a woman being robbed. A former high school and college football player, he jumped into action, chasing down the robber and tackling him -- all while on the phone with 911. Moments earlier, he'd turned the corner as a woman with an infant was trying to chase the man down. "I have a nine month old baby and all I could think was my wife walking the streets every single day and it happening to her," Assem. Kim said. The man ducked into an office building, and for a moment Kim lost him and got on the phone to call 911. But then, a Good Samaritan spotted the suspect, now wearing different clothes, and he charged up Main Street. The assemblyman was still on the phone with police as he tackled him. 25-year-old Daniel Fish was charged with grand larceny. The assemblyman's glasses were apparently broken in the scuffle to take down the suspect, but it's all good. All in a day's work for Assemblyman Ron Kim!